Sleeping dragons. Stirring the thin blankets of secret cold-war facilities, nuclear power plants and feebly stored radioactive waste. We quietly sneak around their massive shadows. We tell our children fairy tales of mankind’s control over technology, over nature. The story of The Atom That Is Keeping Us Safe, but then the unexpected happens and unspeakable horrors awaken and unleash their terror. People in Southern California have such a sleeping dragon right in their neighborhood: the San Onofre Nuclear Power Plant. Although shut down, it is home to 1,631 tons of radioactive waste. The waste (a witches brew containing plutonium, uranium and cesium, which will be harmful for over 250,000 years) is stored in ill-designed temporary caskets. No one has any long-term plans for this waste. 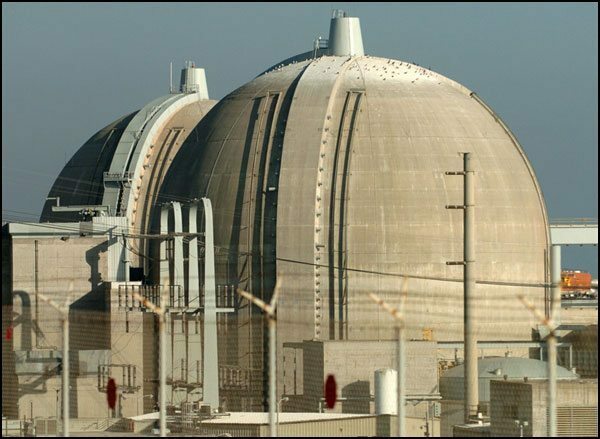 Scientists have confirmed that San Onofre sits in a tsunami zone, on a fault line known to produce a magnitude of 8 (or larger) earthquakes, although the plant was designed to withstand only a magnitude 7 earthquake. You could look to Fukushima or Chernobyl and draw your own conclusions of risk. You could look to the ongoing debate over how safe nuclear power really is and how we think we’re in control of nuclear technology, but refuse to prepare for the unexpected. A government, in case of a nuclear disaster like the Chernobyl explosion, always leans towards insistent denial, cover-ups and reckless disregard for the life and health of its own citizens. The melt-down at Three-Mile Island, Pennsylvania in 1979 is generally considered the worst nuclear disaster in U.S. history, but it wasn’t. In 1959 just north of Los Angeles at Santa Susana Field Lab (SSFL), where researchers performed top-secret nuclear tests, a partial melt-down released massive amounts of radioactivity into the atmosphere for days. Cancer rates of residents in Simi Valley and other neighborhoods close by were and continue to be 60 % higher than the US.. average. The accident was kept secret for 20 years. Even worse is the radioactive contamination at Rocky Flats in Colorado. Built in 1951 this secret cold-war facility just 16 miles west of Denver was one of the biggest nuclear weapons plant in the U.S. 70,000 plutonium pits were manufactured here. 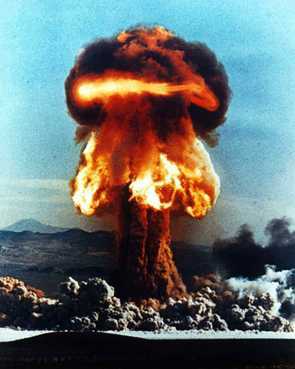 Each pit (roughly the size of a grapefruit) by itself is an atomic bomb and has the lethal strength of the plutonium bomb that destroyed Nagasaki. People in Colorado were never informed about the activities at Rocky Flats. Rumor had it that the plant manufactured cleaning supplies such as “scrubbing bubbles.” Families moving to the Denver suburbs right next to Rocky Flats thought they were raising their families in a perfect, pristine environment with views to the Rockies and crisp mountain air. Workers were forbidden to talk about their jobs. To this day many of them feel it would be unpatriotic to speak negatively about Rocky Flats since it was an important part of the Cold War and our national defense. Many of these workers have experienced illnesses that can be linked directly to Rocky Flats. The plant was badly mismanaged for decades and several tons of plutonium have gone “missing.” Rocky Flats illegally released toxic and radioactive materials into the ground water, burned plutonium waste and experienced hundreds of fires, two of them (in 1957 and 1969) devastating in their size and scale. Radioactive smoke drifted over the Denver suburbs, yet no one was warned, evacuated or informed. In addition to the pollution caused by the plutonium fires, 5200 barrels of radioactive and chemical waste were stored outdoors, exposed to extreme weather for over a decade. The barrels rusted and leaked. Plutonium, americium, cesium and hundreds of chemicals seeped into the ground water and ended up in the drinking water of some Denver suburbs. In the neighborhoods surrounding Rocky Flats, unsuspecting families soon began to note a higher rate of leukemia in children. Other cancers (testicular, thyroid, lung and bone cancer etc.) also spiked. Local farmers reported extremely high rates of infertility and birth defects in their livestock. In 1981 the local County Health Director opposed housing development near Rocky Flats after studies linked off-site plutonium contamination and adverse health effects. He was forced to resign. Finally, in 1989 the FBI had enough evidence of violations of federal environmental laws. The FBI raided Rocky Flats. For the first and only time in our history, one government agency (the FBI) raided another (the Department of Energy or DOE). The following two decades saw a whirlwind of messy problem-solving attempts: local groups, government and state agencies were quarreling over Rocky Flats’ link to illnesses in workers. People living close by were trying to set “acceptable levels of plutonium” in the soil surrounding the plant. A complicated grand jury investigation took place, then a class-action suit was filed and finally a controversial “clean-up” effort happened. The clean-up was originally estimated to take 70 years, but the DOE gave the contract to the lowest bidder and settled for a partial clean-up for 20% of the original cost estimate. The contractor rushed through the “clean-up” in just 10 years. The US government declared the clean-up complete in 2005. Part of the site, however, is so contaminated that it will remain off limits to the public forever. Plutonium, after all, has a half-life of 24,000 years. In 2007 Rocky Flats and a thin buffer zone surrounding the original plant site was handed over to yet another government agency, The Fish and Wildlife Service, who now calls it “Rocky Flats Wildlife Refuge.” People moving to Denver see this lovely and innocent name on zoning and school district maps and are thus made to believe that their new suburb sits right next to a pristine wildlife refuge. They plant gardens in their backyard and the children play outdoors. The wind blows fiercely down from the mountains as they have done for thousands of years. And they will continue to blow, over the dusty, radioactive soil at Rocky Flats, down to Denver and beyond, lulling us all back to sleep. Plutonium inventory differences at Rocky Flats and their relationship to environmental releases. by Thomas B. Cochran, Ph.D.
Nicole Hoepner was born in Germany and is a teacher, environmental activist and a published illustrator. Nicole and has lived and worked in Asia, Europe and currently resides with her husband and daughters near Denver, Colorado. She was just 15 years old when the infamous Chernobyl accident brought radioactive fallout over her home and much of Europe. Her passion for raising awareness towards global and local environmental concerns fuels much of her volunteer work. This appeared at our associated online SanDiegoFreePress.